Home Fashion News More Best Red Carpet Moments 2009! So here we are finally the most wonderful day of the year! Here’s to a very Merry Christmas to you fab readers! I plan on spending the day in the most unfashionable way that I can. Forget the cute little Holiday outfit or even any efforts in the hair and makeup department. Instead through much convincing my clan will hopefully (if all cooperate) be spending the day in their best PJ’s and slippers enjoying a ever so fattening breakfast followed by a little bit of gift opening, movies, perhaps a few games then on to more celebrating by way of a huge Italian meal…hence the comfy ever expanding elastic waistband jammies. Though we were never shorted in the area of gifts, Mom and Dad always emphasized the family togetherness element of the Holidays, so whether there were two gifts or twenty we always felt satisfied and these days let’s face it do I really need more stuff? Not as much as I need my house cleaned, or a few extra hours of sleep! So amidst the eating and the celebrating I hope to linger over all the unread magazines stacking up on my coffee table. No doubt there are dozens of best and worst lists that I have yet to peruse, but of course I have a few of my own favorite best Red Carpet moments to continue from yesterday. I can’t even express fully how breathtaking this mint green Christian Dior gown was on Sarah Jessica Parker. This was truly a homerun of grand proportions. 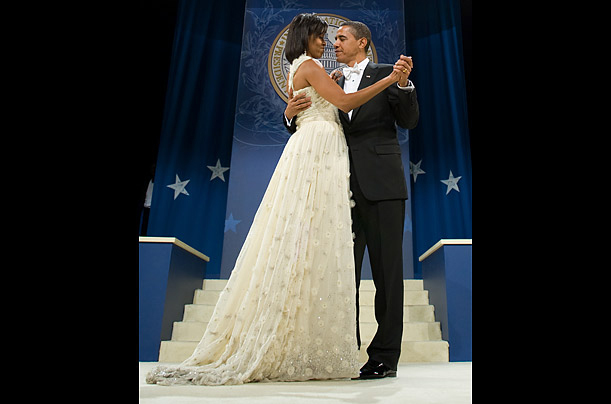 The First Lady’s Naeem Kahn gown was absolutely fabulous and she worked it like a true stylista. Though I am not one to compare her to Jackie O. I do think our FLOTUS is definitely a fashion plate to be reckoned with. Her Jason Wu Inauguration Night gown was also completely stunning! She does posses the grace needed to go from J Crew to ball gown with ease. Another must mention Kate Winslet’s azure colored Narciso Rodriguez gown at the Screen Actors Guild Awards fit like a second skin and emphasized all her assets perfectly. And of course I can’t end without mentioning Angelina Jolie once again for her Elie Saab Couture gown and green gems at this years Academy Awards, as always she makes understated look easy. Penelope gets my vote here. Red carpet royalty. Michelle O? Not so much. Sorry… I just don’t look at her choices and say glam. Kate looks stunning in not only the dress, but the color!